The Constable Volunteer Firemen Inc. took delivery of a brand new 2014 Ford F-350 Crew Cab Short Box with a 6.2L Gasoline Engine in April of 2014. This truck replaces our previous 2000 Chevy 2500 that we retired this past winter and serves as our utility pickup truck and plow truck for our department. But with a new truck coming in, ETA-62 was removed from service in our department due to age and fatigue. The 1987 Engine-Tanker served our department well for many years and will move on to serve its next owner in a new life. Pictures of the new U-69 coming soon. 17-M-68 Deploys to Long Island to assist local fire depts. On October 30, 2012, Constable Fire Dept's Misc 68, along with Malone Callfiremen Misc 308, Bangor Misc 218, Hogansburg/Akwesasne Misc 99, Tupper Lake Misc 368, and Saranac Lake Misc 349, were requested by Franklin County OES to assist Nasseau County NY and their local fire depts with water removal and assist with fire supression. Chief Trombley and Firefighter Greg Pickering deployed with M-68 for a 3 day tour in Long Island. 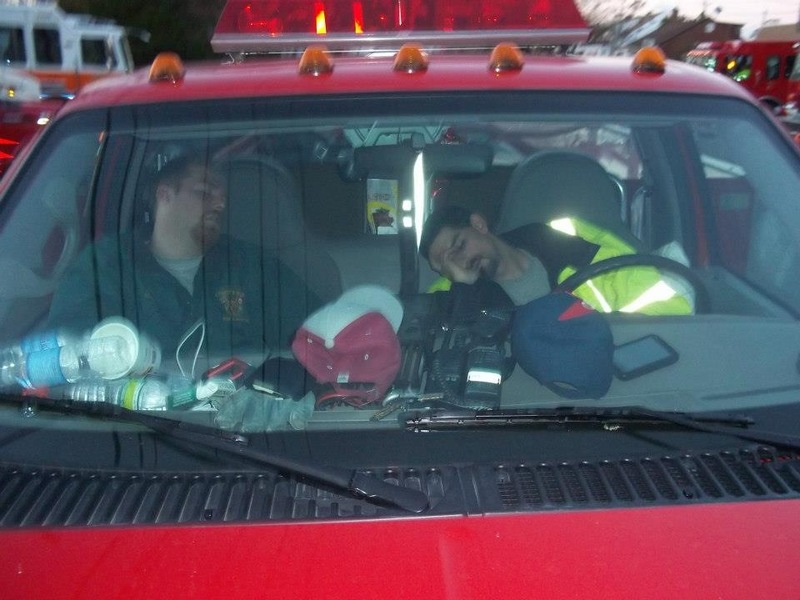 Pictured are Chief Trombley (driver seat) and Firefighter Pickering (passenger seat) on some downtime during their deployment to Island Park NY.